Today’s guest post is from someone I have never met before! I think that’s so fun, and and example of how the internet can bring people together. Enjoy today’s words from Mrs. Gray! This time last year, I wasn’t watching, waiting for the calendar to get to August 7th. It didn’t mean anything. It was just a day. This year, though, I’m growing ever-aware of how close it actually is. Last year, August 7th, lunch time, table 11. Mr. Gray’s phone rang, and our life was forever changed. I remember knowing then that it was a moment that would change our lives. It is the only time I remember being cognitively aware of such a change–even before I knew what was being said on the other end of the phone. I distinctly remember the look on Mr. Gray’s face and the words that came out of his mouth. As the waitress rounded the corner and I had her bag our lunch up, we couldn’t go back to life before that phone call. I didn’t realize it at the time, but my husband’s very first instinct–very first–was to take a cue from King David in 2 Samuel 12. Once I figured out what was going on there, I realized how differently he and I grieved. For the most part, I had to keep going and doing–I had a full-time toddler to attend to. When times got quiet, I took to my journal or my blog. He had to keep going in a different way; he needed to be there for his parents and lead our family spiritually as we navigated new waters. While we grieved very differently, we were also able to talk and live through it together. Our marriage needed us to stay on the same page while Satan fought to pull it apart. We didn’t let the way we grieved cut into our marriage. I remember the first “song” message (side note: God speaks very clearly to me through music, even though I am not necessarily musically inclined or even very interested in it most of the time) that I received. Mr. Gray was by my side, and he was able to rest in it as well. It’s a great God story that I haven’t been able to fully process into written words yet. I will, though, He gave me that story for a reason. He’s affirmed it many times since. There were several times, though, like the grocery store incident where I came back with Instant Breakfast and ketchup, that I was acutely aware of how well-loved we truly are. God has equipped us with some amazing friends and family to be His hands and feet in times of need. We had people take care of Baby Gray on a whim, we had enough food to get us through a couple of weeks while we adjusted to the newness of life after the phone call. God truly provided in every area. I was scheduled to be at a church leadership conference right around the one-month mark, and God provided speakers who spoke directly to me. In a room full of thousands of people, they helped me heal and process. I’ve read since that often times when people approach grief anniversaries, they just wait for it and watch for it. The actual day is usually anticlimactic since it’s been built up in one’s head for the preceding days, weeks, or months. I remember this to be true, especially with the one-month mark, but continuing until about the six-month mark, I was almost counting days like a recovering alcoholic does. It was truly a healing process we were going through. The first birthday came and went, followed by the first Thanksgiving, Christmas, Easter and so on. We made it through them all. As I watch and wait for August 7th (and 9th and 11th) to roll around this year, I look back on all the things God has taught me through the grief. It is a precious reminder of how big our God is. He takes the cracks and holes that The Enemy might try to sneak in and fills them completely and abundantly with Truth and love. 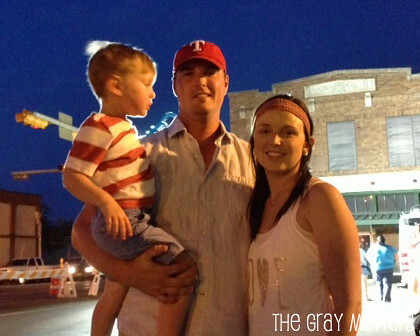 Gray, party of three! Mrs. Gray enjoys being a work at home mama, date nights (and every night) with Mr. Gray, and Revolution Church. In her free time, you can find her writing, running, reading–or if it’s a fall weekend, you can find the Grays at Kyle Field. She blogs regularly at The Gray Matters.